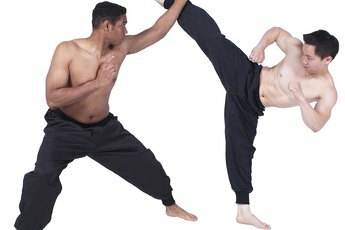 Ninjutsu teaches weaponry and hand-to-hand combat skills. Ninjutsu dates back hundreds of years to the feudal era in Japan. The ninja were stealth warriors skilled in espionage, weaponry, hand-to-hand combat and many other areas. Their knowledge has been passed down for centuries, and their skills are still taught today. If you are a beginner in the art of ninjutsu, your first lessons should include rolling. You must learn how to roll to prevent injuries when you are thrown to the ground. In addition, rolling helps you evade attacks. The forward roll is a good place to start. In Japanese, the forward roll is called zenpo kaiten. Lay a tumbling mat down in the middle of the floor. The mat should be large enough for you to complete this technique without rolling onto the floor. Kneel down on one end of the mat. Slide your left knee back. Reach out with your left hand and place your palm on the mat. Swing your right hand toward your left knee through the space under your midsection. Tuck your chin to your chest. Lift your knees off the mat. Push your body forward using the balls of your feet. Roll forward across your right shoulder without touching your head to the mat. Roll gently onto your back with your knees bent. Do not touch your feet to the floor. Practice this forward roll several times from a kneeling position until you feel proficient at it. Stand up on your feet to progress to a forward roll from a standing position. Step forward with your right foot. Swing your right hand toward your left knee like you did while practicing the kneeling roll. Tuck your chin to your chest. Bend your knees slightly as you fall forward. Roll across your right shoulder. Keep your momentum moving forward so you roll across your back and then back up to your feet. Return to a standing position with your right foot forward. You should be balanced and ready for combat when you return to standing. 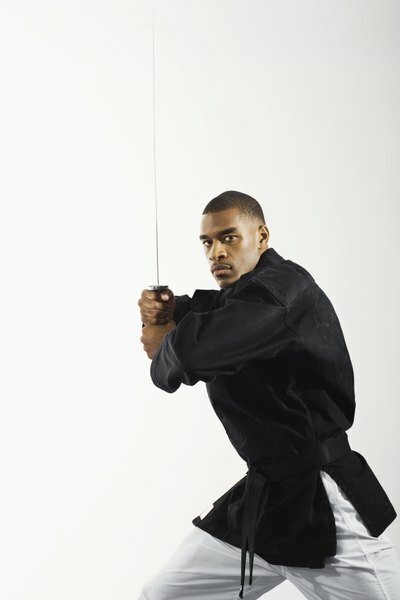 Ask a training partner to stand to the side of you with a padded sword. Tell your partner to slowly swing the sword in a horizontal motion toward your face. Practice forward rolling under the sword as it comes toward you. This drill may take several attempts before you get the timing down. Ask your partner to swing the sword a little faster and to give you less break time in between each roll. Remember to tuck your chin while rolling to avoid head and neck injuries.